Free career assessment tests are free versions of career tests that help find your source of satisfaction and what values motivate you. By detecting your values you’ll know why you’re passionate about a certain area of interest — your greatest passion. But what are values? Values are part of your core beliefs that give meaning to your career and life. For example, you put a high value on integrity and honesty. You’ll feel sick and stressful if you work for a company with a low standard of business ethics. On the other hand, if the values align with a company that values ethical business conducts chances are you’ll achieve a high level of job satisfaction. So, before you commit to a real career change make sure you understand what you value high in your career. Is it pride in performance or recognition and status? Or you may value teamwork higher compare to personal decision-making. 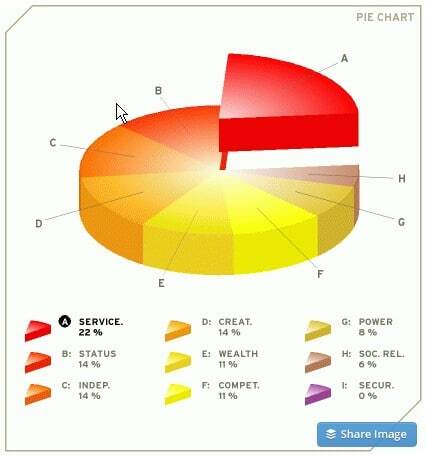 Career value test is a free career test that measures your work values, preferences and needs. It includes values clarification exercises and an in-depth analysis of your current career situation. The Career Values Test measures 10 work values: service orientation, team orientation, influence, creativity, independence, excitement, personal development, financial rewards, security, prestige. It has 88 questions and takes about 15 minutes to complete. So take a closer look at your values and see how they relate to your current job. By completing free career assessment tests you’ll find the source of your satisfaction as well as your dissatisfaction in your career. 1.123Test. 123Test is free and easy to take. This work values inventory measures nine career values: Wealth, Service/Dedication to a Cause, Entrepreneurial Creativity, Autonomy/Independence, Security/Stability, Power, Technical/Function Competence, Social Relationships, and Status. The test consists of 36 pairs of value choices that you have to pick based on best fit with your ideal job or you as a person. Even if it is difficult you have to pick one. Your choices will show what makes you happy or unhappy in your work and career. My test result shows a snapshot of my most important value: Service/Dedication to a Cause. This dominant value matches with my current work, but that may shift over time. What if the values don’t match your current job? Try to change your work or find part of them outside your work by volunteering or doing what you enjoy in your free time. 2. MyPlan. The Work Values Test from MyPlan can help you find your work values. You will be asked to rank different aspects of work that represent six underlying work values and find out what careers you might want to further explore. The free career assessment test measure six work values clusters: independence, relationship, achievement, working conditions, recognition and support. The report ranks your work values starting from the most important to least one. You can then get a list of 739 occupations ranked based on their match with your personal work values. The higher the rank the more a career agrees with your work values. Myplan requires you to sign up and fill several personal information — which is not a good practice for a free career test — to get your test report. Independence was the reported dominant work value. When I clicked on the CareerMatch I got three highest match scores: Prosthodontists (80%), Counseling Psychologists (79%) and Clinical Psychologists 978%). Because the test results only offer overviews of your career values I would suggest you to take paid career test on this page.